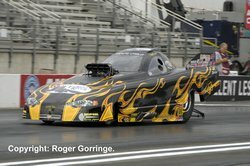 The NHRA Full Throttle Drag Racing Series final round of the year was suspense-filled as the Countdown to One produced its Champions in both Professional and Sportsman categories some ending after qualifying and others going almost to the wire. The weather provided some good times as the air cooled from midday seventies to forties and fifties in the evenings. Grandstands were not overly packed but there was a large crowd of fans particularly on the Saturday and Sunday. 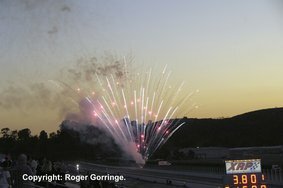 After the qualifying euphoria for most of the European teams, especially in Top Fuel, and the sheer joy of participating for the remaining Brit racers in TAD and Stock at the high desert venue of Las Vegas two weeks ago, Pomona proved a desperate time as the eye-opening luck suddenly evaporated in California. 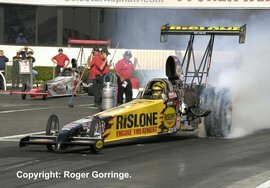 It was only Swiss driver Urs Erbacher and Denmark's Stig Neergaard who made it into the Top Fuel field but at the final count only Erbacher survived to race. In TAD Britain's Derek Flynn and ex-pat Mike Manners secured a place in round one of eliminations, Sweden's Micke Nilsson in Super Comp managed to make the second round and the UK's Spencer Tramm made a first-round exit in Stock Eliminator. The international field included many Canadians and ex-pat New Zealand Funny Car racer Grant Downing as well as ex-pat Australian Dave Grubnic in Top Fuel. 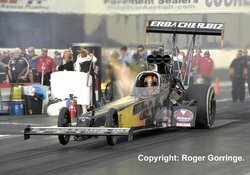 Only Swiss driver and Eurodragster.com sponsor Urs Erbacher made the final Top Fuel field with a number thirteen one thousand foot spot of 3.928/294. Leading the tough field with an impressive Saturday night last-ditch attempt was multi-Champion Tony Schumacher with a stunning second quickest ever one thousand foot and track record time of 3.772 at 320.58m ph in the US Army car which put him just ahead of points rival Larry Dixon in the Al-Anabi machine whose 321.58 mph was a track record. The remaining Europeans inexplicably struggled with Stig Neergaard getting a final twenty spot on a 4.087/284, Eurodragster.com sponsor, Holland's Lex Joon banged the wall on Friday's 3.95 which disqualified the pass, then blazed the tyres and pedalled to a 6.587/90 on another pass which put him twenty-third, and a fire-balling last pass did not improve. Norway's Thomas Nataas after the numbers in Vegas fell foul to over-powering the track and to a short chute cable that deposited the linen just after the launch on one occasion; his best was a troubled 10.381/70 for last place. Round one losers included ex-pat Australian Dave Grubnic who was the first to lay down instant smoke in the right hand lane. 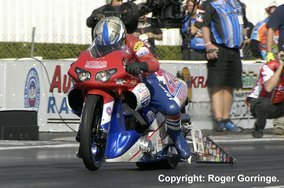 Bob Vandergriff Jr. also succumbed to instant smoke as Cory McClenathan won with a fiery 4.437/178. Brandon Bernstein beat eighty-one year old legend Chris Karamesines both with respectable lights, 3.873/314 win to a 3.955/308! 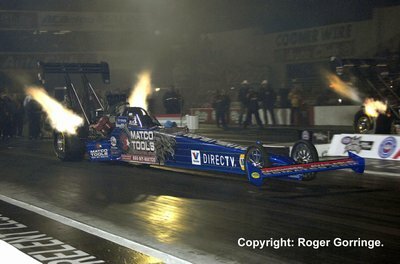 Urs Erbacher was another victim of tyre smoke at the hit leaving Antron Brown to win 3.824/317. Las Vegas winner, Spencer Massey put down a 3.870/312 beating Scott Palmer. Mike Strasburg hazed the slicks at three hundred feet allowing Schumacher a 3.838/314 win. 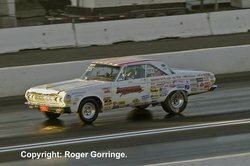 Del Cox Jr. lost cylinders from three hundred feet slowing him as Dixon surged ahead to win with a 3.822/316. Last pairing saw Doug Kalitta get the nod with a 3.846/316 to down Steve Torrence's chances. Young Spencer Massey seems to be making a name for himself as he notched up a 3.841/316 win by a car length over Doug Kalitta's 3.896/311 try to open round two. A holeshot leave by Morgan Lucas was to no avail as he slowed to a 4.312/257 as Tony Schumacher pounded ahead winning with a 3.836/318. 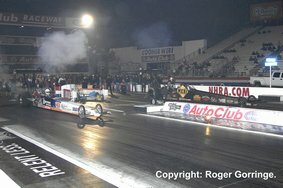 Antron Brown caught and passed the small lead from Brandon Bernstein, the 3.856/314 beating the 3.903/309 by over a car length. It was made clear that if Cory McClenathan beat Larry Dixon in this pairing Schumacher would be Champion; and in a real tight race Dixon held onto his better leave scotching any points advantage with a winning 3.842/315 to a 3.829/320. Spencer Massey worked his magic once more in the semi-final facing up to Championship contender Larry Dixon in the Al-Anabi car who smoked the tyres slowing to a 5.025/143 as Massey recorded a 3.810/316 win. 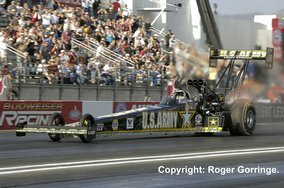 Antron Brown left on Tony Schumacher's US Army car and put down a 3.822/316 win as ‘The Sarge' charged hard to lose with a 3.830/315. 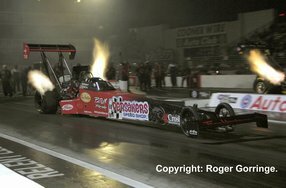 Schumacher may have lost the race but he had just amassed enough points to be declared the NHRA Full Throttle Top Fuel World Champion for the sixth straight time beating Dixon into second place with a two-point margin - close or what? 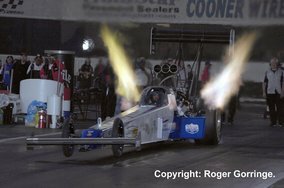 The final was won on the start line as Spencer Massey's luck ran out as he red lit away his chances knowingly slowing to a 7.994/85 in the US Smokeless Tobacco Co./United Association dragster and letting Antron Brown take the Matco Tools car to a 3.801/316 event win. In the final Funny Car qualifier Ashley Force Hood reigned supreme, a 4.059 with a faster 310 mph speed put her just ahead of her Dad, John Force with another 4.059 timing this time with a 309 mph speed and just behind that was the third Force car, Robert Hight's 4.067 the 310.55 mph being a new track record. 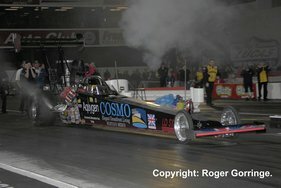 Bob Bode sat on the number sixteen bubble with a 4.172/298 clocking. 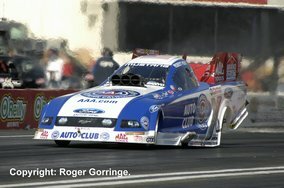 After qualifying and just getting into the Countdown to 1 then blitzing his way through all comers in the last three playoff races Robert Hight was declared the NHRA Full Throttle Funny Car World Champion with his Automobile Club of Southern California Mustang. Round one winners were Tim Wilkerson by a half car length over Jack Beckman, 4.126/300 to the alongside 4.145/306. 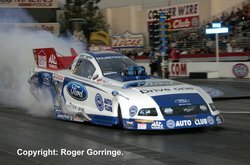 Matt Hagan won with a 4.139/304 as opponent Tony Pedregon slowed at half track. 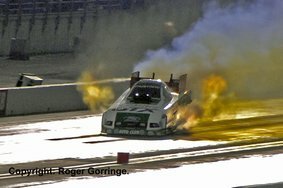 Ashley Force Hood ran a 4.240/289 win as Bob Bode hazed the slicks and got close to the wall. New Champion Robert Hight lit the slicks then got well crossed up at half track but held on to win, 4.842/196 beat a slowed up Jerry Toliver. 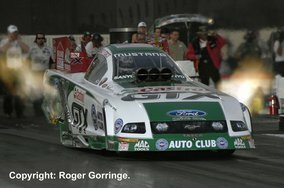 Former teammates John Force and Gary Densham raced with Force leaving first recording a 4.149/307 win as Densham chased hard losing with a 4.162/297. Ron Capps was still hoping for a place in the high points so needed a win, he got it with a 4.312/236 beating the 4.382/254 try of Bob Tasca lll. 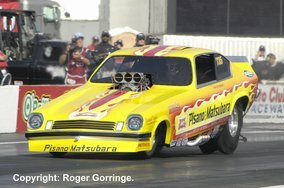 Mike Neff started his charge with a 4.184/296 win over an up in smoke 8.478/78 from Jim Head's Toyota. 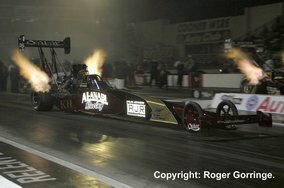 Lastly in round one Del Worsham put the Al-Anabi car into round two when a 4.595/189 was good enough to stay ahead of a tyre-smoking Cruz Pedregon. Round two saw the end of Robert Hight's dream weekend as he hazed the slicks at half track and lost some cylinders, his 4.368/214 losing to Tim Wilkerson's 4.116/303. Ashley Force Hood caught and passed a slowing Del Worsham, 4.146/306 beating the 4.373/238. A close race happened next as Ron Capps left in front of Matt Hagen and held on to take the light with a 4.1444/310 to the losing 4.126/305 try. No quarter was given in the next stanza as teammates John Force and Mike Neff faced off, Neff getting the better light and coupled with his 4.121/306 beat team owner John Force's 4.138/306 that ended up in the sand trap as only one ‘chute deployed. Ron Capps '09 Charger backed by NAPA Auto Parts hazed the slicks at half track on his pass against Ashley Force Hood; a 4.775/248 was no match for the winning 4.133/307. Tim Wilkerson's Levi, Ray & Shoup Inc sponsored '09 Mustang hit tyre smoke at around two hundred feet out slowing him to a 5.440/147 and allowing Mike Neff to notch up a winning 4.197/291. The final was a team affair and what a blinder of a pedal-fest it became. Mike Neff in the Ford Drive One Mustang left just a tad before the Castrol GTX Mustang of Ashley Force Hood, Neff went into tyre smoke then pedalled, Force Hood then hit smoke and pedalled both cars getting a little sideways with Force Hood getting really wild in trying to stay ahead with the car belching huge header flames then tagging the wall immediately disqualifying her and allowing Neff the win light with a 5.131/285 to the 6.219/112. Mike Edwards has been on a roll recently and a 6.562/210 put him on the Pro Stock pole with just two other cars in the 6.5s, Ron Krisher and Jason Line. Las Vegas winner Larry Morgan was the bump at 6.637/209 showing how close this class can be. 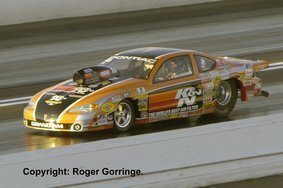 After qualifying the soft spoken and often humble Mike Edwards was declared the NHRA Full Throttle Pro Stock World Champion in his Young Life/ART backed '06 GXP. Round one winners included Rodger Brogdon over Ronnie Humphrey, Kurt Johnson against Johnny Gray, Allen Johnson beat Vinnie Deceglie, Greg Stanfield over Ryan Ondrejko after a marathon staging duel, Greg Anderson against Dave Northrop, Mike Edwards over Larry Morgan, Ron Krisher beating a loose Rickie Jones and Jason Line getting the better of Jeg Coughlin. Kurt Johnson opened round two with a 6.617/209 win courtesy of a good leave against Ron Krisher's losing 6.781/209. New Champion Mike Edwards ran a winning 6.579/210 to beat Rodger Brogdon's 6.642/209. It all went awry for Greg Stanfield when he pushed too hard carding a red light 6.787/170 giving the win to Greg Anderson's 6.578/210. Ending the round was Jason Line and Allen Johnson and Line got the win when his 6.571/210 beat a troubled Johnson. Despite Champion Edwards' much better light and a 6.669/196 Greg Anderson managed to reel him in passing him with a winning 6.576/210, then Kurt Johnson carded a neat 0.001 light to keep him ahead of a quicker and faster but losing 6.555/211 from Jason Line's Summit Racing Equipment ‘08 GXP, Johnson's 6.624/209 getting the win. The final was won on the startline as Kurt Johnson in his ACDelco '09 Cobalt was way too quick pulling up a cherry on the Tree and making Greg Anderson in his Summit Racing Equipment '09 GXP react on a 0.005 light to keep his side legal, the win was 6.564/210 to a disqualified 6.603/210. 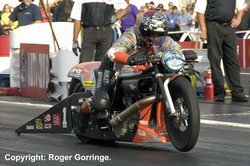 Of the twenty four Pro Stock Motorcycles entered there were eleven Suzukis, eleven Buells and two V-Rods making up a mixed bag that recorded six second passes, eleven in all, with Hector Arana leading the pack on a 6.918/193 and with Bailey Whitaker sitting on the sixteenth bubble at 7.047/187 making it a tight field to get in. The first round started with a clash between Andrew Hines and Michael Phillips with Hines getting a 6.977/192 against a troubled 10.043/82. Karen Stoffer who had done well in earlier qualifying out-performed herself with a red light 6.965/191 giving Larry Cook the 6.962/188 win. David Hope cut a nice light and held on for the 6.986/187 win as Craig Treble failed to catch him with a 7.023/190. Former Champ Matt Smith ran a sub par 7.413/147 as Jim Underdahl capitalised with a 7.059/191 win light. 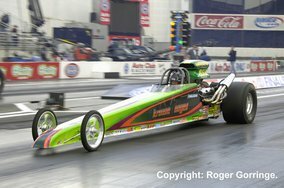 Reigning Champion Eddie Krawiec recorded the top speed of the meet with a winning 6.950 at 194.91mph as Steve Johnson lost with a close 6.977/191. The Auto Club of Southern California Road to the Future candidate Douglas Horne proved his worth with a 6.995/191 win over Freddie Camerena whose 7.026/192 was not quite man enough. Bailey Whitaker, the number sixteen qualifier, faced the might of Hector Arana's number one and in a predictable outcome Arana's 6.910/192 beat the 7.091/185. Junior Pippin ran a winning 7.133/187 to see off the 7.318/185 from Shawn Gann as the last pair of the round. Douglas Hope continued to show promise with a 6.993/191 win dispatching David Hope's 7.028/187 to open round two, then Junior Pippin got by a red lighting Larry Cook, 7.201/185 to the wasted 7.072/169. Adding more points in the last knockings of the chase to the Championship was Eddie Krawiec whose 6.959/192 beat Jim Underdahl's better leaving 7.107/188. Andrew Hines who qualified ninth managed to almost keep his cool as Hector Arana blatantly red lit with a -0.012 making Hines cut a -0.004 red light, it was a first or worst and Hines' 7.044/192 got the win as Arana rolled in second with a 7.224/154. Showing why he was picked as an AAA Rookie of the Year candidate, Douglas Horne on his '09 Buell XB9R got out first against the '09 Buell of Junior Pippin and a 6.940/192 beat Pippin's Piranaz backed 7.045/187. Teammates Eddie Krawiec and Andrew Hines then faced off in the semi final pairing, Hines' Screamin' Eagle/Vance & Hines '09 V-Rod red lit, recording a losing 6.968/191 as Krawiec's similar mount took the light with a 6.953/192. 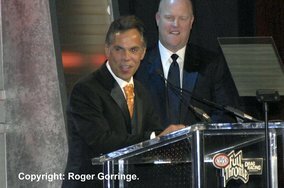 The NHRA Full Throttle Pro Stock Motorcycle World Championship was decided by a mere two points and awarded to Hector Arana after this round. The final was a contest between Eddie Krawiec on his Screamin' Eagle/Vance & Hines V-Rod and the new boy Douglas Horne on his Buell XB9R and it was some commiseration to Krawiec that he took the event win as he had just seen his Championship go by two points, a 6.905/194 beat the red lighting 6.955/191 from Douglas Horne. 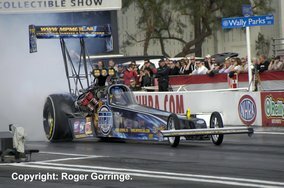 It was great to have Eurodragster.com sponsor, Britain's Derek Flynn flying the flag in Top Alcohol Dragster driving the Gold RV/Miersch Industry car to a fifteenth qualifier. Mike Manners the ex-pat Brit and Eurodragster.com sponsor made the field in thirteenth place. However their luck was gone in round one as firstly Flynn went out with a red light 5.330/263 to Johnny Ahten's seen-it 10.202/89, then Manners slowing 7.389/120 lost to the 5.350/266 from Bill Reichert. A close call in round one almost saw Brandon Johnson on his head he managed to control his violently out of shape car from ending up upside down in the wall, he lost to Courtney Force. Number one qualifier Monroe Guest lost in round one to Canadian, Shawn Cowie. Leaping ahead to the semi finals where Jim Whiteley managed to dispose of Bill Reichert's Bar's Leaks/Risolene car, a wheels up launch by Reichert along with a 5.369/269 was not enough as Whiteley's 5.298/270 beat him by half a car length. 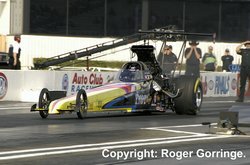 In an all Team Force battle, sisters Courtney Force faced Brittany Force, a 0.006 light from Courtney coupled with a 5.286/267 beat the Brand Source backed car of Brittany whose somnolent leave then a 5.369/269 failed to get the catch up. The final went to the J&A Services/Rator Industry blown machine of Jim Whiteley who beat the Sanyo sponsored nitro injected car of Courtney Force, a 5.262/270 was enough for Whiteley as Force followed with a losing 6.066/241. 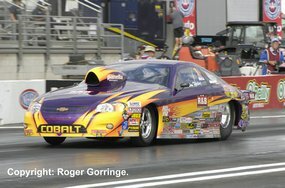 Top qualifier in Top Alcohol Funny Car was Sean O'Bannon and over the weekend he never looked back. 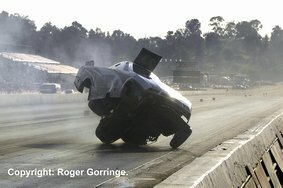 The round one crash of Steve Gasperelli has been well documented; suffice to say he emerged unhurt from his battered race car. Also losing a race car was Ken Webster who put his Synoil Fluids machine into the catch nets during qualifying. Going from the semis Daniel Oliver who had beaten Vern Moats in round one then Alexis DeJoria in two faced off against Mickey Ferro's Ryco Hydraulics Monte Carlo and it was the better light from Oliver that came up trumps with a 5.567/257 win to the close 5.531/258. Australian, Steve Harker's Styla Mount.com Chevy achieved the better leave and his 5.571/252 was not bad but it was not enough to stave off the 5.538/259 from Sean O'Bannon. The final was a close call as both lights were good with Sean O'Bannon's Forest River RV backed Monte Carlo getting the better light, then a 5.534/260 got the Ontario CA resident the win as the Goodwin Real Estate Appraisal Services Monte Carlo of Daniel Oliver runner upped with a 5.549/258. Competition Eliminator came down to a battle between two Chevy Cobalts as Dan Fletcher ran the winning 8.076/134 to beat the 10.132/100 from Justin Lamb. Super Stock had a mountain of entries which was eventually whittled down to the final between Jimmy DeFrank and Bob Bales. The 8.762/141 from the DeFrank Cobalt took the trophy as Bales in a '98 Grand Am fouled. Stock Eliminator was where Brit Spencer Tramm tried his hand driving the Gold RV/Rizzoli's Automotive '67 Camaro. Tramm performed well in qualifying but rolled through the beams in round one of eliminations handing the win to Glenn Person. 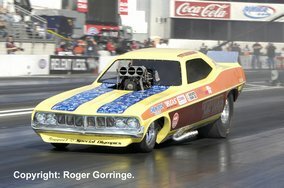 The final was a bout between Jimmy DeFrank and John Shaul and it was Shaul's Plymouth Fury which succeeded in taking the event trophy with a 9.772/134 against the 9.736/134 from DeFrank's '69 Camaro both under index. Super Comp was another massive class. Sweden's Mikael Nilsson went out in round two against Mike Ferderer. 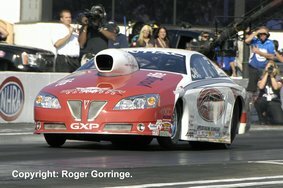 The final was between Greg Boutte and Rick Beckstrom with Boutte managing an 8.922/174 win to the chasing 8.901/177. Super Gas had its usual large entry of stunning machines led by Gerald Turczyn whose '04 Corvette performed the perfect 9.900 leading the forty-three runners. In the final though, it was the '06 Grand Am of Mike Ferderer that won in a battle of break-outs, his 9.893/170 beat the '63 Corvette of Steve Williams whose 9.883/172 became-runner up.